It's very important to have a proper sight picture & proper sight alignment before firing your handgun at your target. You should also train with all your firearms in both light and dark environments so you don't panic under stress in a situation you aren't ready for, such as shooting in the dark and suddenly being unable to find your sights. This post applies to common 3-dot sights. There are a lot of other sight options out there that require different sight pictures, such as Heinie Straight Eight Sights, which have 2 dots, or XS Sights, which have a front dot and a V notch in the rear. There are also different ways to position your sights onto your target (depending on what you prefer or whether or not your pistol sights can be adjusted), but this is the sight picture style I train with: by centering the top of my sights into the center of the target. For target shooting, I focus my eyes on the front sight - This leaves my front sight clear and in-focus, while my rear sight becomes slightly blurred and out-of-focus. For fast, defensive shooting, I instead focus my eyes on the target - This leaves my target in-focus, while my sights are slightly out-of-focus (but the 3 dots are lined up on target). While slow target shooting for accuracy, sometimes I will close one eye. For quick, defensive shooting, I always practice shooting with both eyes open. Some people focus on their sights and target differently, but this is what works for me. Line up the front sight post in the middle of the notch in the rear sight. Keep the top of the front sight post level with the top of the rear sight, while keeping an equal gap of daylight on each side of the front sight post. While shooting in the dark with night sights, you will not be able to see lights gaps on the sides of your front sight post very well, if at all. 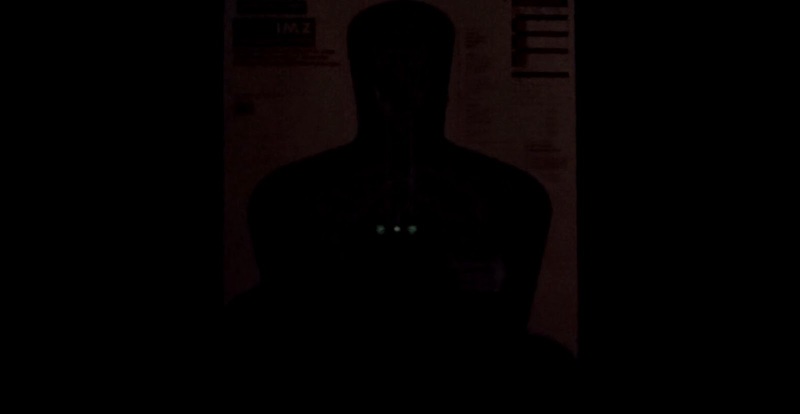 In this case, line up the glowing dots on your night sights so they are all level across the target before firing. While shooting with a light attached to your pistol, you won't be able to see the dots on your sights well, so you have to get the same sight picture without the dots. Line up the front sight post in the middle of the notch in the rear sight (just like you would in daylight). Keep your sights level across the top, while keeping an equal gap of light on each side of the front sight post. Night sights are extremely important for low light shooting and are a great investment. You should also have a light attached to your pistol (if possible) or have a hand held light for low light situations so you can identify your target. Regardless of whether or not you have night sights or a pistol light, you should train and be able to shoot in low-light situations in case you ever have to. Note - There are many options for handgun sights. Some will have a larger gap (on each side of the front sight when lined up with the rear sight), some will have a smaller gap, and some will have hardly any at all. Not all 3-dot sight alignments will look exactly like these photos. Nice c;ear review with good tips as always. Everyone have their own style but its important to get the fundamentals right. 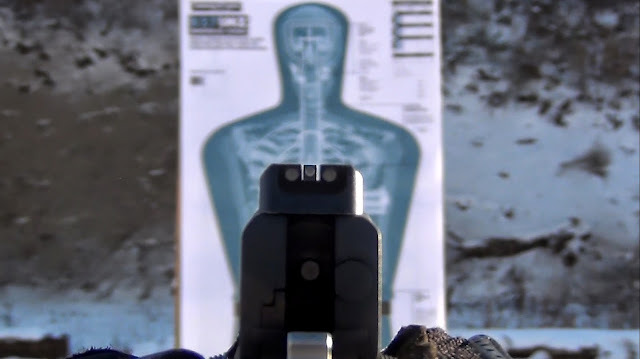 Excellent tutorial on sight picture and alignment..
Ive used all types of 3-dot sights over the years and by far, these ( http://www.vikingtactics.com/sights_mounts.html ) in my opinion have really bridged the gap for combination sights. Why have a set of day sights and a set of night sights when you can have both? These things are expensive! at 250.00 with shipping and handling, when in stock, you are going to shell out quite a bit. I only have one sidearm with these and they came on it. I was in the shop looking for a S&W M&P C.O.R.E in 9mm, for open class...well the young man in the store who was supposed to hold it for me when it came in did not, and it was sold 20 minutes before I got there...yes I cried like a 5 year old at Chuck-e-cheese's..But, when I looked down, I saw this FDE coated M&P 40 VTAC...the finish and the sights sold me..Where I live, you can take an 870 outside and within 15 minutes it has turned a bright orange...guns rust so bad down here i really have to think twice about taking one out of the safe...but this one has that nice finish which has been very much rust and corrosion resistant.. The tru-glo uppers on these sights really help me find my sight picture in the day and the bank of tritium lowers are fantastically bright in low light environments. I only had one issue: Due to the excess height of these sights, similar to supressor sights, my group, however small, was about 6 inches low at 50 yards. So, in short, aim high. During night shoots, using the lower bank, my groups were point of aim and point of impact at 50 yards. Redbeard - Thanks, you give a lot of good tips and info. Been enjoying your comments. I'll have to check out those sights. Check out a guy named Ron Avery. Theres a few videos under "Haley Strategic" and "range time with Cory and Erica" channels. He really breaks down the science of shooting. Its all based on 3 fundamental physical sciences. Physics, Trigonometry and Bioomechanics. Physics, being able to understand the recoil and utilizing tension in your shoulders and forearms to stabilize the weapon in the recoil stroke. Trigonometry, understanding aiming and the flight path of the bullet. Biomechanics, being able to understand how the human body works, with all its sensors and computers, and how our muscular and skeletal systems work. Figuring out how all 3 aspects of these physical sciences work together are key in shooting. Physics: if you can understand what happens when the weapon discharges you've already gained a ton of ground. Being able to analyze, with shotgun, rifle or pistol what your body does when challenged with the recoil of the weapon is critical. Either be recoil's B**** or be its master. Trigonometry: being able to align the sights in relation to the target in order to achieve the correct flight path which will give you your hits. This is really interesting when you study long range shooting, but is equally important in close quarters. 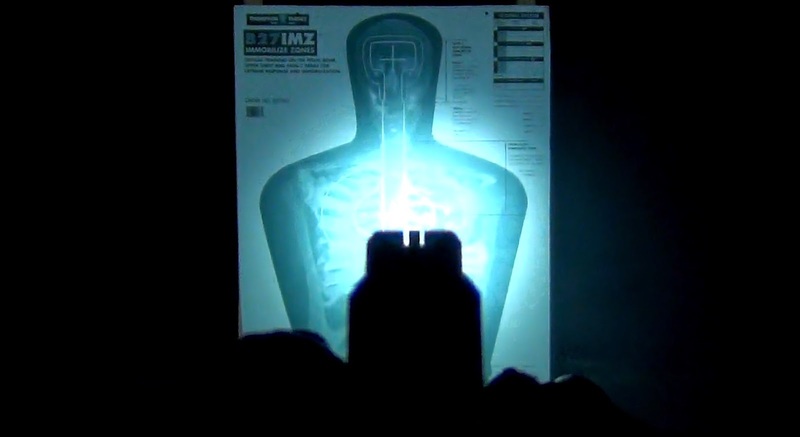 Biomechanics: how you align your body, hold your body and the weapon. Stance, grip, tension on different sections of the weapon. Like with speed shooting with a pistol. If I create a certain amount of tension on the outside of my dominant forearm, I dont get that stereotypical drift off center mass up and to the right. Also being able to use your body as a fuse to transmit recoil to the ground like an electrical current. Recoil, like electricity is just energy. If electricity ALWAYS wants to go to ground, then we should be able to make recoil do the same. Its not all about text book procedures, cookie cutter for every shooter. Do what works best for you. Smooth your movements out and make them economical, then your time to hits will decrease and your accuracy will increase. Its different for every shooter. I was a terrible shot when I joined the army, but once I got with some really good shooters and broke it down into scientific terms and was able to figure out what I needed to do, I began to excel and shot expert every time. Its been really hard for everyone that Ive tried to train around here. Most folks, especially males, tend to have that ego and its hard for me to get it into their heads that shooting is a scientific endeavor not solely based on skill. They just want to blast off rounds. I always say that all you need to hit a deer at a half mile with a .308 is a bullet, a rifle and a calculator, but that usually falls on deaf ears. I do think that women are the best dancers, because there seems to be a common trait among females of being more in touch with their body and how it moves. So, a woman is more apt to understand biomechanics. Shooting is a dance that needs practice. Its a steady walk on the path to mastery. Very good article on guns.....Proper training is important to fire gun. The situations may be different for firing.In nights you need to be more focused to lights. When the top posts silhouettes are level, the dots are not, making shooting from point of aim with the dots slightly lower. I have considered filing down the rear posts some, but am looking for a better solution to solve this issue. Billy, if you find one let us know. I have the same issue having just changed over to night sights, and it's making things difficult to say the least. I want a consistent sight picture.